The most remarkable aspect of Fijian pre-history is its antiquity. It is now known that people had reached the Fijian archipelago as early as 2000 years before the birth of Christ. Considering the fact that the Vikings, acknowledged as Europe's greatest sailors, didn't reach American until three thousand years later, or the fact that Columbus made his famous voyage only some five hundred years ago, the Fijian achievement must be seen as extraordinary. The question is, who were the first settlers. And the answer is that we don't know. There are some who are prepared to speculate and Dr Roger Green, Professor of Anthropology at Auckland University, in New Zealand is one of them. He calls this vast archipelago "Island of South East Asia". These migrants were relatively new, even though they were different from those of the people already living in the islands of Papua New Guinea, the Solomon Islands, the Hebrides (now Vanuatu) and New Caledonia. The first settlers were of Negrito stock with dark skin, woolly hair and other typical features. The newcomers were fairer, had straight or wavy black hair and we can assume were of many type stock. they would seem to have been good sailors and craftsmen and excellent potters who made a distinct type of ware we know as Lapita pottery after its initial discovery in New Caledonia. A picture emerges of these "Lapita" people. Sailors, adventurers, good navigators and consummate craftsmen. The trail of their pots, hooks, obsidian cutting tools and ornaments leads down from New Britain through some of the outer islands fringing the Solomons and Vanuatu, suggesting that perhaps they were not powerful enough to force settlements on the bigger islands which were already supporting large populations of people. In this classic difference between the two groups we see the racial characteristics of what was later to be defined as Melanesian and Polynesian stock. The Melanesians were to retain their grip on the western island of the south Pacific but it can be fairly assumed that a great deal of the "Lapita" blood found its way into its main stream. At some stage, about 2000 years before the birth of Christ, a canoe load of adventurous "Lapita" sailors either deliberately set out to the east or were driven off course by a westerly wind and made landfall in the Fijian archipelago. Dr. Green's theory is that these were the first settlers, not only because at that time they would have had the necessary maritime technology, but also because their pottery is found throughout the whole of Fiji. There is no way of knowing how long they enjoyed Fiji to themselves. But at some stage the Melanesians followed. It is reasonable to suppose that groups of Melanesians who were in contact with the "Lapita" people in the west would have been quick to take advantage of the better craft used by the "Lapita" seafarers and to incorporate them into their own technology. It is also reasonable to assume that there may have been only a single successful voyage in each instance. Certainly Fijian legends speak of one canoe and one voyage. The canoe was the Kaunitoni and its people were the settlers. The legend says that the first canoe to touch land on the main island of Viti Levu found an indigenous people. The legend also says that the people of the canoe made their way inland from where they eventually spilled to other parts of Fiji. This would suggest that the most favourable coastal areas were already settled and that there was no room for the new arrivals, leaving them no choice but to move into the less hospitable interior, where over the ensuing generations their population built up and eventually spilled over. We know who the Fijians are today, but we also know that they are not truly Melanesian when compared with what must have been the parent stock back in Vanuatu, the Solomon Islands or New Caledonia. The people of Fiji are larger - much larger in some cases, as in the province of Nadroga where even the women are nearly 180 centimetres (6 ft) tall. they speak a different language and enjoy their own material culture. At the time of European contact Fiji was a feudal society with a chiefly system of the most oppressive kind - unlike the Melanesian system where statue was earned by an individual who produced the most and share it. In Fiji the chiefs had absolute power of life and death over commoners in contrast to the Melanesian system which opposed such tyranny. We can try to imagine those first years. The canoe arriving, the hostile reception from the established population, the skirmishing and then the long trek into the interior; the build up of population and then the subsequent probing towards the coast for both peaceful and hostile interaction with the indigenous peoples. "Women and land are the reasons men die", says an old Maori proverb and there is no reason to suppose it would have been different in pre-historic Fiji. Villages raided, men killed or enslaved and women taken as the prize of victory. Slowly the blood of the distinct ethnic groups would have diffused over both populations, but not to such an extent as to form a homogeneous whole. we can imagine two distinct groups, each modified by the blood of the other but each still retaining its distinct racial characteristics, building up to a series of greater confrontations until finally the descendants of the "Lapita" people are forced out, first into the eastern area of Fiji and then to Tonga and beyond, leaving the dominant Melanesian people in control until many centuries later when once again the descendants of the "Lapita:" people, now known as Polynesians, would attempt to return and win back what they had lost. The kai Viti - the people of Fiji - as they call themselves to this day, were left in possession of the large island archipelago which they began to organise on the Polynesian hierarchical system. Heads of powerful families could create political states by conquest and tyranny and by Machiavellian policies of alliance and treason. Friends and allies could become bitter enemies over-night. Political states, whose heads were often first cousins and sometimes step-brothers, were often locked in suicidal conflict. During greater wars minor civil wars would sometimes take place within political confederations and loyalty was something no Fijian chief could count on. Fijians practised polygamy for both political and personal reasons. Alliances were consolidated by marriage, but women were also given as tribute or taken as a prize of war. The political advantage gained by marriage was often eroded by political instability at home caused by rivalry amongst the male issue. Thus families rose and fell and states rose and fell. 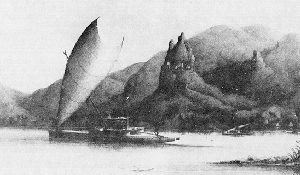 During this long pre-contract period Fiji was visited by Tongans who came on regular trading expeditions; Samoans, Wallis Islanders, people of Futuna and Rotuma. At some later stage, not long before European contact, there must also have been contract with Micronesia, most probably Kiribati 1100 miles to the north. The probability of such contact is beyond dispute because the development of the Fijian sailing canoe is so obviously based on the Micronesian model. In 1976 I made such a voyage myself in a sailing canoe built at Tarawa, Kiribati. To my mind it is more likely that a Micronesian canoe arrived in Fiji rather than a Fijian canoe arriving at Kiribati. The famous English navigator/explorer James Cook notes the difference between the large voyaging canoes he saw in Tonga during his first visit in 1769. During his two subsequent calls he was able to note that the Fijian model had almost completely displaced the indigenous Tongan craft. It was at Tonga that Cook first learned of Fiji and saw Fijian visitors who were conspicuous amongst the locals because of their darker skin. The Tongans maintained an intricate social relationship with Fiji through trade, through the supply of mercenary warriors to warring chiefdoms and through ancient rituals such as, for example the daughter of the Tui Tonga being reserved in marriage to the Tui Lakeba as she was considered too sacred for marriage to a Tongan. It would seem that Tongans were by far sources of Fiji. the Tongans came for sandalwood which was used for its scent and for the great double canoes which were so difficult to acquire in Tonga because of the lack of suitable timber. In turn the Tongans brought their own trade goods and their arms which they sold to the highest bidder and on whose behalf they would fight. The Tongans could fish profitably in such waters, particularly in the period immediately after the first European contact when they came close to controlling most of Fiji and probably would have done so if it had not been for European intervention. As the Fijians had no written language and relied on memory for their history, (the wise men memorising intricate genealogical tables), we have no record of what happened. Potsherds, hooks and artefacts unearthed in archaeological excavations are our only clue to the dim and distant past. These show settlement of Fiji to have been achieved some four thousand years ago whereas today most Fijian people trace their descent through some ten generations to the landing of the canoe the Kaunitoni and the chiefs Lutunasobasoba and Degei. The canoe is said to have landed at Vuda between Lautoka and Nadi where Lutunasobasoba chose to remain. Others moved towards the Ra coast and settled on the seaward slopes of the Kauvadra range. Degei, who was subsequently deified, had numerous sons. They quarrelled and with their followers moved over much of Fiji until they finally settled, took wives from among the local people and founded the families that grew into the present chiefly yavusa recognised to this day. The yavusa is the largest social unit of the Fijians. According to R.A. Derrick in his History of Fiji (Government Press, Suva, 1946), a yavusa is strictly neither a tribe nor a clan; its members are direct agnate descendants of a single kalou-vu or deified ancestor; the unit originating from the Lutunasobasoba migration. If the founder of the family had only one son the yavusa retained its patriarchal structure, even after his death, when in accordance with Polynesian custom his son succeeded him. If his family included two or more sons, the chiefly succession was from brother to brother and on the death of the last brother it reverted to the eldest son of the senior brother who had left male issue. Each member of the first such family of brothers found a branch of the yavusa called the mataqali which thereafter retained its identity, acquired a distinctive name and in the course of time became the traditional custodian of a designated function. In a fully developed yavusa there was mataqali: 1, the turaga or chiefly mataqali, who were in the most direct line of descent, by male links, from the common ancestor, and from whom the ruling chiefs of succeeding generations were chosen; 2, the sauturaga or executive mataqali, whose rank was next to that of the chiefs of the blood and whose function it was to carry out their commands and to support their authority; 3, the mata-ni-vanua or diplomatic mataqali from whom the official heralds and masters of ceremony were chosen; 4, bete or priestly mataqali, into certain of whom the spirit of the common ancestor was supposed to enter and 5, the bati or warrior mataqali whose function was war. The third and smallest unit was the i tokatoka which was a subdivision of the mataqali and comprised closely relating families acknowledging the same blood relative as their head and living in a defined village area. The simple branching of yavusa into mataqali and of the mataqali into the i tokatoka was subject to disruptive influences of war, internal strife, migration and conquest. This was a dynamic process subject to internal and external stress which saw many of the original yavusa broken or merged wholly or in part with others strong enough to seize and hold the position which thereafter became hereditary. Some of the vanua were united by conquest or accretion into kingdoms known as matanitu. But this is regarded as a recent development during the wars of historic times. Among the people of the interior and western Viti Levu large confederations were unknown. In 1835 the people of Fiji said there were thirty-two places in the group entitled to rank as matanitu, but during the British Colonial period the Native Lands Commission found the political status and order of precedence of the chiefdoms to be as follows: Bau, Rewa, Naitasiri, Namosi, Nadroga, Bau, Macuata, Cakaudrove, Lau, Kadavu, Ba, Serua, and Tavua. The life of Fijians was governed by ritual accompanied by elaborate ceremonies and strict observance of ancient custom. A serious breach of etiquette or error in precedence could lead to bloodshed or even war. There is a recorded instance of the chief of Rewa inviting his bati (warriors) from different parts of his state to a feast in their honour., Whereas on this occasion the chief decided to bring them together but a dispute quickly arose over precedence between two parties and neither would yield and determined to settle the issue with the club. The chiefs of Rewa, fearing that once started such a disturbance could lead to a greater conflict, promptly fired muskets on the disturbing parties. There were appropriate ceremonies for every event of importance and also for many minor ones. Life was governed by superstitious beliefs. Good and evil fortune was ascribed to the will of gods and spirits which needed to be constantly propitiated with gifts but especially the presentation of the bodies of slain victims which would then be redistributed for cooking and eating. Major events such as the installation of great chiefs were sometimes conducted over a pile of bodies and the birth, coming of age, marriage and death of great chiefs were likely to be marked with human sacrifice as were the stages in the buildings of war canoes - and especially their launching which was over the bodies of live victims tied down over the skids - and the setting up of the principal posts for temples or chiefs' houses when live men would be buried to "hold them up". On such occasions the ceremonial preparation and serving of yaqona was an important part of the ritual as was the presentation of the tabua. In recent times the name tabua has come to signify the tooth of the sperm whale. In former times it was a special stone cut and polished in the shape of a sperm whale tooth, but larger in size, which was used. The incidence of whaling ships in the Pacific during the nineteenth century caused a large supply of whale teeth to become available. At first these were introduced into Fiji by Tongans who had a better access to them, but later European trading ships brought these directly. Tabua were the price of life and death and indispensable adjuncts to every proposal, whether for marriage, alliance, intrigue, request, apology, appeal to the goods or sympathy with the bereaved. Priests were an important link between the gods and the people but the gods were capricious and, even if there was proper observance of all customary rites and the presentation of suitable gifts, the god or gods could still withhold their favour. At such times an explanation might be demanded of the priests and on some occasions the gods have been challenged to fight. Degei, the deified ancestor of the Lutunasobasoba migration, was recognised as the most important. He is said to have lived (in pre-Christian times) near the place of his original settlement following the landing of the canoe at Vuda and his march to the Kauvadra Range. Degei became a huge snake living in a cave on the mountain Uluda. No cave has been found on the summit of Uluda, but there is a cleft hardly wide enough for a man to fit into. There were gods of agriculture, fishing, craftsmen and war. The god of war often received the greatest attention because so much depended on him. No campaign was begun without his temple being either completely rebuilt or refurbished and the presentation of lavish gifts. The bure kalou (the temple), of which two fine examples may be seen in Fiji today at Pacific Harbour and at Orchid Island near Suva, was the home of the god and was marked by lofty roofs which dominated all others and fully decorated with sennit and cowerie shells. A strip of masi where it was draped before a corner post and it was down this curtain that the god would descend when invoked. Because Fijians believed in the power of gods and spirits and in sorcery, the office of the priest was important. Priests were the link between gods and men and for this important function they received gifts for the use of the gods, but in reality appropriated by the priests. The ritual in seeking the god's favour centred on the preparation of a feast which would be presented in the temple along with an offering of the tabua. All would then sit silently in the cool, gloomy interior of the bure kalou and gaze with expectation on the priest who would sit before the strip of masi along which the god would be expected to descend. The priest would begin to twitch until finally he would be in a fit with violent convulsions, sweat running out of every pore and frothing at the mouth. In this state the priest was in the possession of the god and he would speak to the assembly in a strange voice, often ambiguously, until he would cease to shake when it was recognised that the god had departed. Much depended on what the god promised. If success, all was jubilation but if it was failure, not even the boldest chiefs would dare move. The feast and gifts offered to the god would then be shared by the priests and petitioners. Only the spirit substance of the gifts would be used by the god. The Fijians believed in an afterlife. This was an island somewhere to the west from where the original migration (migrations) had come. The path taken by the soul was always difficult and fraught with dangers. Evil spirits awaited the traveller; some needed gifts while others had to be fought and prevailed against so that the soul might continue on its path. Those who were unsuccessful were eaten. It could be said that the world of the Fijian was completely bound by superstition and ritual and sorcery. Every action could bring gain or harm. Nothing could be done without some consequence. Illness or death was attributed to the action of sorcery; to the breaking of the tabu or to the displeasure of the gods. The Fijian also believed in the importance of dreams and omens and in the power of spells to such an extent that if informed of a death spell he would be likely to die unless relief could be obtained by a more potent spell. Some omens were extremely powerful - the sight of a kingfisher was sufficient to send a war-party into a retreat. Chiefs held absolute power over their subjects and could have them killed at will. The strictest laws of tabu applied to the protection of the privilege enjoyed by chiefs. Commoners and women had to move out of the path of chiefs, kneel, clap their hands and greet him with a cry of respect. In passing his presence they had to stoop or even sometimes crawl; if carrying objects these had to be lowered; when entering the house in his presence the commoner had to use a door reserved for him. The power of chiefs was demonstrated in the 1840s by a chief of Rewa. An American trader who had purchased the Island of Laucala near the mouth of the Rewa River had requested the chief to stop people from going to it. A canoe load of the chief's subjects, unaware of the prohibition, was seen on its way to the island. The chief immediately sent warriors who clubbed the unfortunates to death. The largest chiefdoms were the most oppressive tyrannies. The artistic feeling of the Fijians was expressed in the construction of the great war canoes; in the building and decoration of temples and chiefs houses; in the decoration of weapons, cloth, pottery and in the intricate and colourful decoration of the person. The meke, a combination of song and dance, are popular to this day whilst the proper execution of ceremonies and rituals, such as the serving of the chief's yaqona and the presentation of the tabua, were dramatic events. Until the coming of Europeans, the Fijian craftsman worked with stone tools and his achievements, when seen in this light must be regarded with credit. With these tools he built great canoes and houses for the chiefs and gods. The house of Tanoa at Bau was 40 metres long and 13 metres wide and that of his son, Cakobau was 24 metres long, 11 metres wide and 12 metres high. The huge posts, some of which were nearly two metres in circumference, were felled in the bush and then hauled by man-power to the sea, brought to Bau and then manhandled again to the site of construction. It was in the construction of the great war canoes that the art of the Fijian craftsman was revealed. two examples (on a small scale) may be seen in Fiji today. One is in the Fiji Museum at Suva and the other at Orchid Island near Suva. The canoe at the museum was built in the early 1900s and is find example of exquisite craftsmanship. It is truly a work of art. The difference in the work of the time when the canoe was built and now can be seen readily in the restoration work which seems crude in comparison with the original. But both canoes are small in comparison with the great craft which ruled the seas during much of the 19th century. The greatest fleet was assembled at Bau where some of these craft were of unbelievable size. The famous Ra Marama, which was built at Taveuni, was nearly 32 metres long and more than 5.6 metres wide. It took seven years to build it. Such canoes not only required the expertise of craftsmen but the resources of great states. It is difficult to imagine, for example, how many kilometres of sennit (coconut husk cord) would have to be made for the lashings which would hold the various parts of the canoe together. My own estimate, based on the outrigger canoe built at Tarawa, Kiribati, in 1975-76 which we sailed down to Fiji, would suggest that upwards of ten thousand metres of sennit would be required if rigging was included in the total. The art of pottery brought into the South Pacific by the gifted and versatile "Lapita" people survived in Fiji but failed in Tonga, Samoa and east Polynesia on account of the lack of suitable clay. The Fijians still make pottery and it is possible to join a tour to a village in Sigatoka where the art is demonstrated. But the pottery of recent historic times has degenerated considerably from the ware made by the first settlers. It was an important trade item carried to Tonga and Samoa and on at least one occasion, possibly by the only canoe to make such a voyage, as far as the Marquesas Islands more than two thousand nautical miles to the east. As throughout the rest of the South Pacific, cloth was made from the paper-mulberry tree. The craft is practised to this day and may be seen in the Lau Islands and especially at Taveuni. The trees are specially cultivated in groves. When about four metres high and some three centimetres in diameter the trees are harvested and the skin removed for processing. This is done by first steeping it in water and then by scraping and beating until the desired texture is achieved. This cloth is known as masi in Fiji but is also called tapa. Much of it is directed at the tourist trade as a curiosity, but it is also used by Fijians as a dress for ceremonial occasions. In former times there were many regional styles of decoration. It is hard to imagine the people of those times being afflicted by "unemployment" and it is sometimes difficult to imagine that this can be so today. Houses need constant attention and repair; there were ropes and nets and mats to be made; weapons, utensils of every kind, fish hooks from bone and shell and wood, needles, slit gongs large and small, canoes of all kinds, combs and ornaments and huge plantations to maintain and harvest, the surplus being laid down in special pits to ferment and congeal into a paste which would last for years. The best of all the labour of craftsmen, gardeners and fishermen was enjoyed by the chiefs.